Sober Look: Crude oil vs US equities - a dislocation? Crude oil vs US equities - a dislocation? 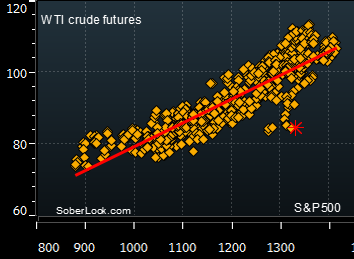 When running a regression of the absolute levels over the past 3 years, one would obtain an R-squared of 0.8 (correlation of 0.9) between the WTI futures and the S&P500. Clearly both are highly correlated to the US economy and the energy sector is a sizable component of the US equity market (about 13% of the S&P500). That is why this recent divergence between the two asset classes really stands out (chart below). Levkovich may be right about the changes taking place in the US energy industry. Declining global demand can also explain the divergence between the two. WTI rising supply is clearly another factor. But these types of changes are generally far more gradual than this sharp dislocation we've experienced recently. One could therefore argue from this chart that either the US equities are overvalued or WTI has sold off way too sharply in recent weeks . What next from the lunatic RBA? Нефть цель 75 от 53 - ДОСТИГНУТА. Новые цели.